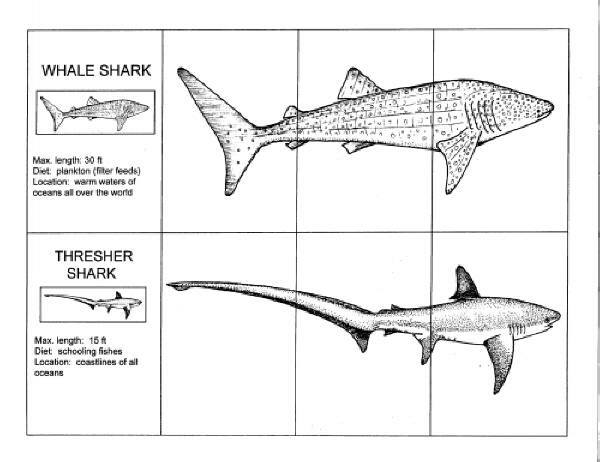 Purpose of activity: Primarily to learn about twelve very different types of sharks, but secondarily to practice visual discrimination (having to look very carefully at similar shapes and determine the differences) as parts of sharks are matched up. Description of activity: Pictures of sharks are cut into three pieces. Players play a game with the cards trying to put the sharks back together. An information card gives the size of the shark and where it lives. Time needed: At least 20 minutes for the simplest game, more like 30 minutes for the more complicated variations of the game. Materials you will need: Copies of the pattern pages printed onto card stock.